Repeating the definition of ‘Shopper Marketing’ a million times with a million explanations using more than a million examples since the year 2006 has been a tedious task and we love it. An explanation that works even with the aunt – “Shoppers and consumers are not always the same and are defined by different mind-states. People are consumers, the moment they decide to buy they become shoppers. Just like a marketing person understand consumer behaviour, we understand shopper behaviour and device strategies to convert people to buyers.” Putting things in the context of something they already understand. BUYSTORIES came across some very interesting articles on Shopper Marketing over just the last 1 week and decided to summarise a few key points. Managing Director at Angle Orange, Pierre Le Grange – Shopper Marketing is the practice of using shopper insights to define a marketing mix that appeals to the shoppers’ state of mind along the path to purchase and positively influences shopper behaviour – resulting in conversion from shopper to buyer. Honestly one fails to understand why retailers need consumer campaigns at all, except for the one off bonanza sale to acquire new customers (which too should be lead by shopper understanding). A great experience (product mix, deals and subconscious elements) ensures repeat visits. The job is to sell and sell more to those who visit you and that we know can’t be done with any TV, press communication. Shoppers are better connected than ever before; they are more informed and empowered to make considered purchase decisions. On the words of Scott Cook, founder of Intuit – Brands are no longer what we tell the consumer, it is what consumers tell each other. There is therefore, a real need for brands and retailers to acquire an intimate understanding of their shoppers through insights, in order to stay ahead of their competition. 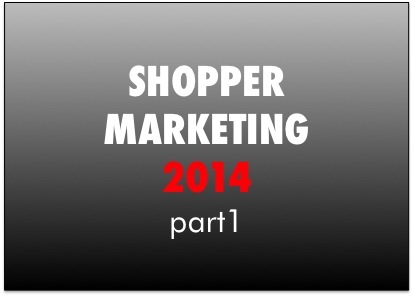 In an age of e-commerce, or even m-commerce, any consumer can also be a shopper. As in general marketing, marketers are focusing on emotion. Brands such as Mastercard and Frito-Lay are conducting research into emotional drivers within the shopping process. This entry was posted on October 10, 2014 by thebuystories in insights, Shopper Marketing and tagged 2nd moment of truth, Buystories, CUstomer Experience Managenment, marketing mix, shopper, Shopper Marketing, Shopper Marketing 2014, shopper profiles, shopping experience.